Speaking of steps (as per the title of this posting), we recently traveled to Watkin's Glen so that the wife could show me the gorge located there. She had visited there earlier this year and wanted me to see it. We thought we'd do a two day trip, but it dwindled to one and we made a dash to the Finger Lakes the Saturday before Labor Day. The weather didn't look promising. It did rain on the trip there (four hours door to door), but when we arrived the clouds parted and the sun shone down on us as though to say, "Welcome, we knew you were coming and we want you to enjoy this place of natural beauty." Okay, it wasn't that dramatic, but it did stop raining for a bit and we were able to make our way through the gorge, a sprinkle here and there, but no deluges. Back to the steps...the story board at the base of the gorge notes about 800 steps. Intrigued, I started counting as we made our way up the gorge. Not a small stream wending its way around the base of a small hill, as I remember the gorges of my youth, it's a cavernous expanse cut into the side of a small mountain. We made our way up 787 steps (yes, I counted each and every one of them), ascending hundreds of feet as we took in the views. Fortunately, I can multi-task. Counting steps, taking in the views, chatting with the wife about the many formations, climbing the steps, dodging rain drops, inspecting water falls, and dealing with hordes of photo hungry visitors kept me real busy. My head was spinning when we got to the top. Not sure if it was the altitude or all of that work...how do you relax at a park when you have so much to do? The place is quite amazing. The gorge is at least a hundred feet deep in spots (maybe more) and at one time, about 10,000 years ago they say, it was all level ground that led to a large waterfalls. The glaciers (those darn pesky several mile thick ice cubes of time gone by) and subsequent running waters tore through rock to take a waterfall that emptied directly into Seneca Lake and created a series of many smaller falls and streams to end up in the same place. Seems like a lot of work, over a long time, to accomplish the same goal, but what the heck...it is an amazing site and that's nature for you. Someone had the idea to make a walkway, with those sept-hundred plus steps, so many could take in the views (and pay for the privilege) and walk under and around falls, get splashed on by water running off the sides of the hills with droplets bouncing off the pavements and protective walls, and it's a beautiful couple of hours. At one point, where the largest falls comes in front of the walkway, seemingly hundreds of people posed for loved ones who tried to capture their visage "under the curtain of water." It's a small space and I kept getting stuck within groups of photographees...I'm certain there are scores of people looking at their pictures, now that they're home, saying, "Who's that guy? He looks like someone famous!" In a hundred years, historians will gather pictures from various groups to study the cultural habits of us humans and find one common link from that day of photos at Watkins Glen...me in each picture...then I'll be famous! We keep moving. Shallow and deep pools, streams, the aforementioned falls, moss, flora and fauna (and who was the third fairy in Cinderella? ), and at the very top the quintessential state operated gift shop! What a site...I looked to see if they carried little Statue's of Liberty, I lost mine somewhere. No luck. But they did have a snack bar, and rest rooms, and a bus to take you down the mountain if you didn't want to hoof it back. Not to be detracted from our morning of exploring nature, and noting we could avoid the steps by taking one of two trails back down, we chose the Indian Trail. I am a bit bewildered that it hasn't been renamed the Native American Trail, but that's another blog. Off we went, and it was smooth going. About halfway down we ran into a "trail closed due to storm damage" sign and were directed back to the stairs. Fortunately for us, we got a second chance to stand under the falls with all of the people with cameras trying to take pictures of all of their friends and family, and getting me in most of their shots, again, as we tried to squeeze by those who appear to be walking behind the curtain of water and stopping me from making much progress for a bit of time (although now I'm thinking they were trying to get me in the shot for better aesthetics). Not as dramatic as Victoria Falls in Africa, one could do a bit of photo cropping and make it seem that one was surviving torrents of water!!! Cool!!! I would recommend the trip highly not only for those who enjoy the outdoors and the happenings of nature, but also for the fact that they conveniently located the gorge near 600 wineries! Guess you know where we spent the afternoon. More on that some other time. We ended the day with a boat ride on Seneca Lake. A couple with a small child sat in front of us and through the bulk of the trip the child was more fascinated with me than with the surf and turf all around. I have that effect on people, you know. I think I'm in a couple of their family pictures now, too! This is all going to work for me, some day! Anywho, I recovered from the ascension of the steps at Watkins Glen (there are a couple of "just eighty steps in this group," heart pounders for certain), thanks in part to generous applications of Yoga Balm to knee joints and a very nice Chardonnay or two, and we are talking of returning again. I will say this about that day. It is a spectacular park, the scenery is stunning, New York State does not make a great red wine (one with the punch the French can deliver, sorry), and I'm going to start charging for being in people's pictures...I realize fame will come, but I won't be around when that happens and I would like some of the cash now! 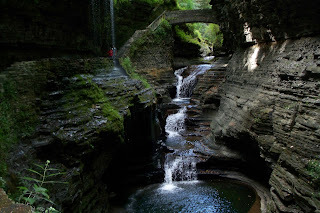 All I can remember about Watkins Glen was the steep steps that made me turn around halfway down. However, no one ever took my picture!